Ireland's best-known folk singer, Luke Kelly, died thirty-five years ago today. He was a lifelong socialist. Luke Kelly was born in Sheriff Street, one of the best-known thoroughfares of Dublin’s north inner city, in November 1940. For decades the area’s workers had laboured on the nearby docks — providing the backbone, thirty years before, for much of Jim Larkin’s organising efforts. But by the mid-twentieth century, those employment opportunities had begun to decline and living conditions were often poor. Luke was born into a one-room cottage on Lattimore Place with communal toilet and taps shared among eight families. But his father, another Luke Kelly, was one of few at the time who managed to get a well-paying job, working in another bastion of Dublin labor at the Jacob’s Biscuit Factory. When Dublin Corporation finally got around to demolishing the Lattimore cottages in 1942, the Kellys became the first family to move into the new St. Laurence O’Toole’s flats, a place which provided the basis for a childhood Luke junior remembered fondly. 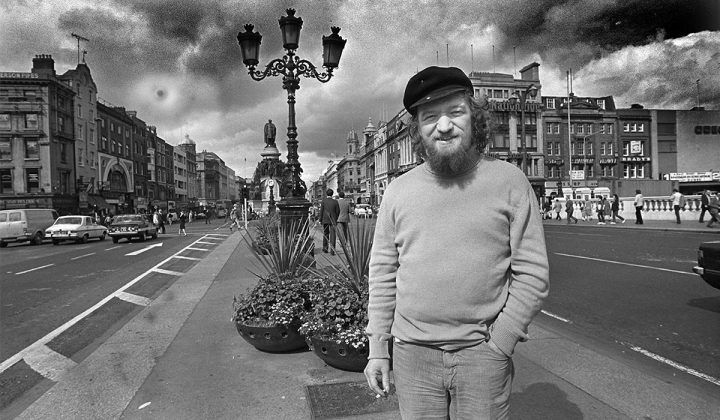 For many in Dublin’s inner city at that time, Des Geraghty remembers in his excellent memoir of Luke Kelly, traditional Irish music was somewhat alien, more a “culchie endeavour” than anything that resonated with urban life. The narrow cultural nationalism which had been espoused by the conservative victors of Ireland’s revolutionary period arguably reached its height in the 1940s, with Taoiseach Éamon de Valera making his famous “Ireland That We Dreamed Of” speech. His narrative of “a land whose countryside would be bright with cozy homesteads” seemed to have little room for aspirations of the working-class. The ‘moral’ Ireland of de Valera’s imagination—Gaelic, Catholic, “living the life that God desired”—had never had much interest in improving the lot of the country’s workers, although they usually paid the cost of attempts to beat the population into its confines. As Luke Kelly grew up and left school at 13, his cultural tastes increasingly kicked against this current. Although he regularly attended Irish céilí dances with his sister Mona, the music he listened to owed more to the sounds of urban America his father had introduced him to — Fats Domino, Al Jolson, Frank Sinatra, Perry Como. He also developed an interest in theatre and musicals. A fire forced the family to up sticks to the suburb of Whitehall in 1953, a move that Luke Kelly never adapted to, but despite the requirement to take the bus every day, he travelled regularly to the Marian Arts Society in Dublin’s inner city where he was actively involved in the plays it put on in the Oriel Hall. His teenage years were to be less happy, however, than his childhood and a restless Kelly soon set his sights on leaving Ireland. In 1957, after a number of frustrating attempts to find decent work, the 17-year-old Kelly followed his brother Paddy to Britain. Arriving in Britain in the late 1950s, Luke Kelly could hardly have imagined how his time in the country would transform his life—and bring him closer to Irish culture. Although London later became the destination of preference for Irish emigrants, at the time Luke ventured across the Irish Sea the Midlands were a safer bet for work. It was there, in Wolverhampton, that Paddy Kelly performed the duty of many Irish older brothers of years past and since in fixing Luke a job and a place to stay. But Luke’s time as a steel fixer on that building site would prove short. After being told by a colleague onsite that others were being paid more for the same work, Luke confronted the foreman to demand a raise. In an incident that his brother Paddy described as naive, but which gave indication of Luke’s budding politics, he was swiftly sacked—and only narrowly avoided having the entire Irish contingent join him. But these years on the road would prove fruitful, with a number of encounters profoundly shaping the Luke Kelly story. The first, in Newcastle in early 1960, would lead him back to Irish music. On an evening he intended to visit a local jazz club, Luke Kelly instead found himself drawn to singing he heard coming from a folk night. There he found a crowd of Geordies reciting The Auld Triangle, the centrepiece of Brendan Behan’s play The Quare Fellow. He recounted years later the pride and enthusiasm he felt hearing a song rooted in the working-class Dublin he grew up in sung with such passion by an English crowd. He began to feel that maybe there was more to Irish music than he had believed during his time at home. The next formative encounter was during his time in Birmingham, when Luke Kelly befriended and then became house guest of Sean and Mollie Mulready. The Mulreadys were active Communists who had been forced to leave Ireland under a cloud after persecution from the Church and state. It was in this company Luke was introduced for the first time to the ideas of Marxism and came to join the Young Communist League and the Connolly Association, an Irish emigrant group linked to the Communist Party in Britain. After his wilderness years, the Mulreadys provided Luke with a solid base—helping him to, in their words, “clean up and find a job.” He also applied himself to night school where he studied literature and left-wing politics under the Mulreadys and also Marxist classicist George Thomson. Luke would later say that “my interest in folk music grew parallel to my politics,” having met the Mulreadys first through his membership of the socialist Clarion Singers Club, and then in turn coming to learn the banjo while living in their house. But by 1962 the paths of politics and music were beginning to diverge. Seeing great potential in his intellect and application, George Thomson arranged for Luke Kelly to go to university in Prague to further his political development. Availing of this opportunity would almost certainly have meant giving up his musical career—so a choice had to be made. Although still committed to socialist politics, Luke had by this time caught the folk music bug. He turned down the chance to study in Prague and packed his bags for a trip elsewhere, returning to his native Dublin as it was beginning to sway with the winds of the 1960s. 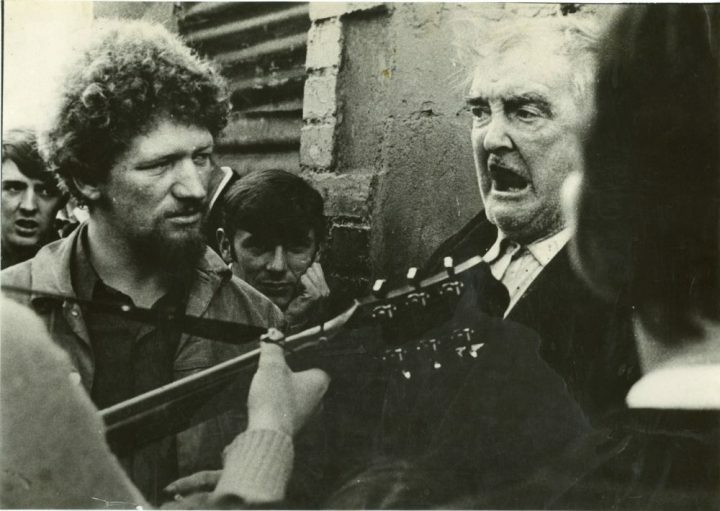 Luke Kelly’s growing interest in folk music reflected an international movement known as the ‘Ballad Boom,’ which influenced the Anglophone world from the late 1950s. In America it was associated with singers like Pete Seeger, Bob Dylan and Joan Baez, in Britain with Ewan MacColl and Peggy Seeger, each run through with radical political themes from opposition to war and nuclear weapons to support for civil rights struggles and the labor movement. But in Ireland the influence of this ballad boom was arguably even more significant as the country emerged from decades of cultural repression at the hands of the Catholic Church and reactionary politicians. Despite achieving independence for the southern 26 counties, Ireland’s revolutionary period from 1916 to 1923 had ended with a crushing defeat for those aiming at more fundamental social change. The socialists, feminists and radical republicans who had fought for national liberation found instead a country of Red Scares, Church-led anti-jazz campaigns and enduring deprivation. 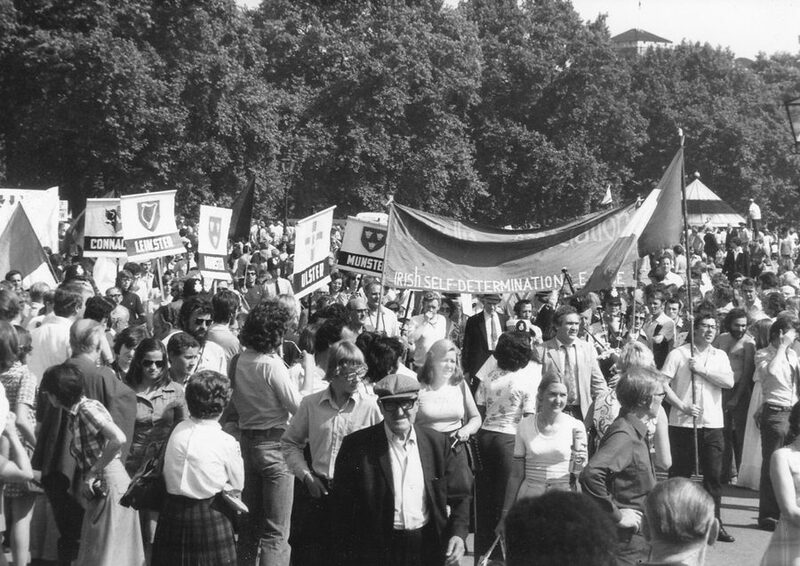 The decades afterwards had seen precious few opportunities for left-wing politics in Ireland. In the 1960s, for the first time, the social context seemed to be thawing out. As Luke Kelly remarked, “There’s a new spirit among young people, a social and political awareness that I think is directly related to the ballads… I think things are going to happen in Ireland again.” From an ever-growing array of sessions in city pubs to the massive popularity of the Fleadh Cheoil music festival, it seemed as though free cultural expression was beginning to stir. Folk music was particularly well-suited to provide the conduit for this development. Many of its forums offered the opportunity for people to bring their own guitars, banjos, flutes or fiddles and join in, and for those who couldn’t play instruments there was always the opportunity to sing. Those attending its gigs were encouraged to learn the songs—or bring their own—and participate in the production of the music. The song themes were quotidian, their spirit rebellious and irreverent, and the protagonists more often working people than kings or lords. It was, in short, a real popular culture. It was into this environment Luke Kelly emerged as one of the standout Irish folk performers of the early 1960s. In 1962 he was a founding member of the Ronnie Drew Ballad Group, alongside Ciarán Bourke, Barney McKenna and its most prominent member Ronnie Drew. 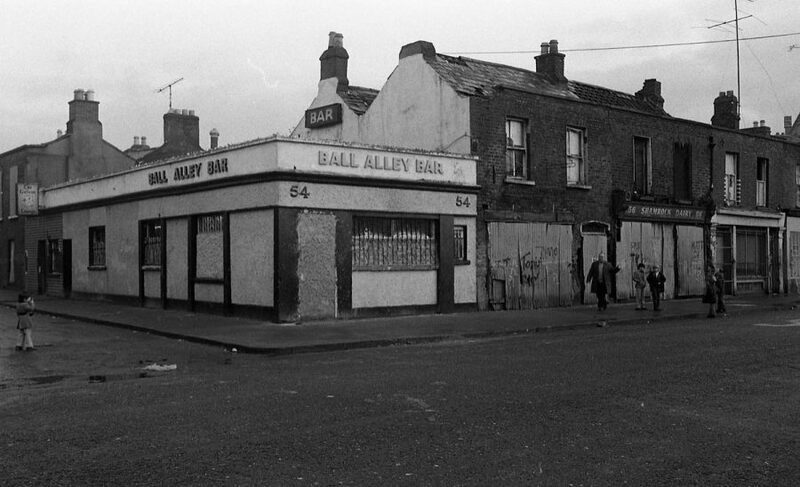 Building a reputation for themselves on the Dublin pub scene, most prominently in O’Donoghues of Merrion Row, the group quickly became popular and arrived on national television by 1963. In 1964 they renamed themselves The Dubliners, allegedly inspired by Luke Kelly’s infatuation with the James Joyce book of the same title, and it was to stick with the group for more than fifty years. In 1964 The Dubliners released their first album with Transatlantic Records, then the premier folk label. A live album, Luke Kelly was its leading vocalist, singing songs like Wild Rover, Tramps and Hawkersand Home Boys Home which would become staples in the years to come. But the real triumph of the album was his rendition of The Rocky Road to Dublin, a song about Irish emigrants to Britain popularized in the mid-nineteenth century. Notoriously difficult to sing, Luke Kelly produced a masterclass which became the song’s definitive recording. Barney McKenna was later to remark that Kelly was the only singer he’d ever heard to sing the song to the rhythm it was played on the fiddle. But Luke Kelly remained unsatisfied by his development as a musician. Traveling back and forth to Britain during this early success for The Dubliners, he set his mind on a musical apprenticeship under the guidance of the man many considered to be the godfather of folk at the time, Ewan MacColl. Ewan MacColl had been born in Salford in north-west England to Scottish parents in 1915. Already a star by the 1950s, his Dirty Old Town became one of the iconic folk songs of the generation. Also a member of both the Clarion singing circles and Young Communist League, he had met Luke Kelly during his first visit to Britain and was sufficiently impressed to take him under his wing in 1964. At that time MacColl had a group called The Critics which had developed from the Singers’ Club he and Peggy Seeger ran. Based in folk mecca the Pindar of Wakefield pub in London, where Bob Dylan had played his first British gig in 1962, The Critics were a polymathic group engaged not only in folk music but drama and poetry, and attempting to blend these different art forms in a way that might deepen the cultural revolution underway. 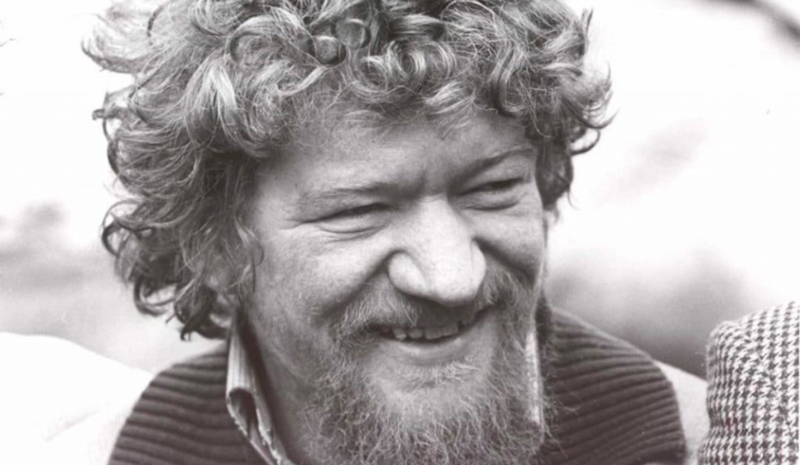 This suited Luke Kelly who by this time was in a relationship with Irish-American actress Deirdre O’Connell, a pioneering figure in proliferating the Stanislavski method of acting in western Europe. Luke continued his political involvement at this time too, becoming more active in the Campaign for Nuclear Disarmament (CND). Again, he found his politics and his musical endeavours very much in tune, adding songs like Ian Campbell’s The Sun is Burning, then the unofficial anthem of the CND, to his repertoire. 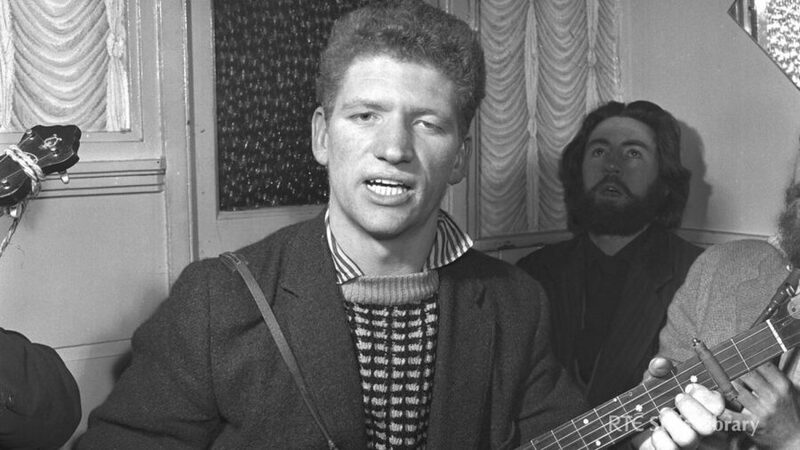 Under Ewan MacColl’s guidance Luke Kelly also learned numerous workers’ songs, from Schoolday’s Over to Hot Asphalt, as well as MacColl’s classics Dirty Old Town, The Travelling People, Shoals of Herring and Come Me Little Son, each of which Kelly would produce remarkable recordings of in the coming years. After a two-year apprenticeship with MacColl, Luke Kelly returned to Dublin and The Dubliners, which by this stage were growing in renown. John Sheahan had joined the group in Luke Kelly’s absence and it now contained an array of musicians who were individually talented. On his return, Luke Kelly’s performances grew in intensity, with his Critics training aiding his delivery. But it wasn’t only his singing that drew attention—Kelly had always played a five-string banjo, a peculiar variation of the instrument Irish audiences were familiar with, but he now developed a technique of standing bolt upright which made his appearance onstage all the more striking. These were conscious echoes by Kelly of an American banjo tradition which weaved from west African slaves through the Wobbly union organizers of the early 20th century and into bluegrass and the 1960s. Luke Kelly’s determination to combine his music with radical politics continued on his return to Ireland. By now a card-carrying Communist in one of Europe’s most vociferously anti-communist states, he used his growing musical reputation to hold an election rally in 1965 for ‘Red’ Mick O’Riordan, General Secretary of the Communist Party of Ireland and a veteran of the Connolly Column international brigade in the Spanish civil war. Though O’Riordan was quick to joke that there were more attendees at the concert than votes in the election, this ongoing commitment to politics was a brave stand for someone aspiring to make it in Ireland’s music industry. The Dubliners’ big breakthrough arrived in 1967, and owed much to state repression—though probably not the kind Luke Kelly imagined. In keeping with the group’s gregarious image they had released an album entitled A Drop of the Hard Stuff. The LP included numerous irreverent and humorous songs, including Weile Waile and Brendan Behan’s Zoological Gardens. But the most controversial was the album’s first single, Seven Drunken Nights, a parody sung by Ronnie Drew of a drunkard arriving home to find his wife having an affair—only to be convinced by ever-more-absurd yarns that his eyes are deceiving him. The raunchy content of this song was too much for the Irish censors, who promptly banned it. Inevitably, the effect of this injunction was to catapult the song to the top of the Irish charts, selling 40,000 copies in two days. Perhaps more surprising was the impact this scandal had on the British charts—with the Dubliners becoming the first Irish band to make the top ten, eventually reaching number 7. Famously, when Ronnie Drew was told the song had made it to the charts, he responded by asking whether that was a good thing. The next year, the Dubliners arrived in America, featuring on Ed Sullivan’s St. Patrick’s Day show in 1968. Although they were prohibited from singing Seven Drunken Nights — “you’re not going to sing that immoral song on my show,” Barney McKenna recalled Sullivan saying—their presence was nonetheless remarkable. In the preceding years Ed Sullivan had been working with the intelligence services to ensure no Communists appeared on his show, but it seems in this instance he assumed a folk group from devout Ireland not worthy of investigating. But by 1968 this caricature of the ‘Emerald Isle’ was increasingly distant from reality. The country was in the grip of profound social upheaval, influenced by international developments but also informed by the 50th anniversary of the 1916 Rising in Ireland. Notoriously, to mark that occasion, left-wing republican group Saor Éire had blown up Nelson’s Pillar on Dublin’s main thoroughfare of O’Connell Street. The next night The Dubliners appeared on stage carrying the pillar’s head, causing uproar in a deeply anti-republican mainstream press. But the most prominent political development of the period was the rise of the Northern Irish Civil Rights Association (NICRA), which brought thousands to the streets of northern cities and towns to demand rights from the sectarian Orange state. After this movement was met with police repression and violence ensued in 1969, Luke Kelly and The Dubliners headlined a peace rally in Dublin’s Phoenix Park. He followed this a month later by debuting one of his own creations, For What Died the Sons of Róisín, a poem which bitterly condemned the mercenary turn of Irish society since the 1916 Rising and the failure of its republican vision. By the end of the 1960s Luke Kelly was convinced that The Dubliners needed to be creatively challenged and take a more overtly political turn in their music. The means to achieve this seemed odd to many, with the band coming under the management of Phil Coulter, a songwriter and producer better known for working with pop groups such as the Bay City Rollers. To many people’s surprise, the partnership worked and The Dubliners produced an album entitled Revolution in 1970, launched in Dublin’s Kilmainham Jail where the leaders of the 1916 Rising had been executed. Revolution lived up to its name in both form and content, with a piano, bass and second guitar added to the band’s musical arrangement. The tracks also amounted to its most political oeuvre to date, with songs including American civil rights ballad Alabama 1958, labor anthem Joe Hill, anti-nuclear weapons song The Button Pusher, as well as anti-fascist tune The Peat Bog Soldiers. A year later these were followed by Hand Me Down My Bible, which Luke Kelly would often preface with an ironic tribute to the Reverend Ian Paisley, and Free the People. The latter song was written as a protest against the introduction of internment in Northern Ireland, a policy which saw thousands imprisoned without trial. While none of these more political songs could be considered The Dubliners or Luke Kelly’s greatest musical achievements, the creative environment which produced them was to nourish truly extraordinary renditions. In the early to mid-1970s, Luke Kelly recorded three tracks which would come to be regarded as amongst his best. The first, on Revolution itself, was Scorn Not His Simplicity, a remarkable song penned by Coulter about his down syndrome son. An early attempt to come to terms with tragic aspects of disability and to counter prejudice, the raw emotion of the song is overpowering but Luke Kelly declined to allow it slip into sentimentality—performing it only once in public. This was followed in 1972 by On Raglan Road, one of the great works of renowned Irish poet Patrick Kavanagh, which he himself gave to Luke Kelly to turn into a song. In the recorded version the haunting beauty of the lyrics comes together with the strength of Kelly’s delivery to create one of twentieth century Ireland’s greatest works of art. In 1974 the heights of political and cultural expression in Kelly’s repertoire were finally united when he sang Coulter’s Town I Loved So Well, a lament about the increasingly repressive and violent conditions in Ireland’s northern six counties which threatened to destroy the romance of Coulter’s native Derry. You’ve only got to look around you to see the injustice in the system. I’m a socialist because I believe it will change all of that. I would stop singing and work at any job with my hands at any time if I thought it would help to improve things for people. I want to see the time coming when, say, a child will get the opportunity to use his brains. We didn’t get that chance and it still doesn’t exist today regardless of what people say. In 1973 Luke Kelly also managed to return to the stage in a prominent role for the first time, earning accolades for his performance as King Herod in Noel Pearson’s Jesus Christ Superstar in the Gaiety Theatre. Though it wasn’t to mark a more sustained shift into theater it was an aspect of artistry Kelly felt he had neglected and he later remarked on his pride at carrying it off. The Dubliners managed a few more good recordings as the decade wore on. The Unquiet Grave on the album Now is beautiful and Parcel of Rogues is an excellent tribute to the best of the Scots tradition, including also a great rendition of 1916 anthem The Foggy Dew. But perhaps the most poignant of them all is the recording of The Auld Triangle, the song popularised by Brendan Behan. Although they never met—Luke played regularly alongside Behan’s brother Dominic, another remarkable songwriter—there was an undeniable connection between Brendan Behan and Luke Kelly. Two Dubliners who brought the wit and personality of the city, as well as the lyricism of its accent, to the world, their lives also illustrate a theme that has come to define the arts in Ireland: the close relationship between creation and destruction. As the 1970s wore on Luke Kelly’s health deteriorated. He spoke, on occasion, about his difficulties with drink, something which seemed totally intertwined with the persona of The Dubliners. In their heyday, it was rare that a Dubliners album didn’t include a picture of a pint on the cover, and much of their material emphasised the role of alcohol in Irish culture. Luke Kelly never fell into moralising about this—he was always clear how much he enjoyed the many wonderful nights over almost twenty years he enjoyed with The Dubliners on the road, saying he “wouldn’t swap them” even as he came off the drink in later years. And yet the testimony of his colleagues, and those close to him, make clear that there were many times he felt forced to play a role, as though his musical performances could only be complete if they were followed by a river of porter or whiskey in some snug. Although there is no direct connection between this lifestyle and the tumour which was to take his life, Luke Kelly suspected in later years that he would have been diagnosed earlier were it not for his symptoms being mistaken for the quirks of a hangover. As the decade wore on he became crippled by migraines. Ronnie Drew and John Sheahan spoke about Luke forgetting lines, or dates, or places, and none of these drawing too much suspicion. It wasn’t until Luke forgot what country he was in entirely during a trip to Iceland or finally collapsed onstage in Cork in 1980 that alarm bells began to ring. Quick medical intervention saved his life that night, but the Luke Kelly that emerged from the surgery wasn’t the same—he became more reclusive, preferring the care and company of his wife Madeleine to performance. Even struggling with such serious illness, Luke Kelly’s extraordinary talent couldn’t be suppressed entirely. His final years produced two especially beautiful, wistful recordings. The first, a cover of The Kinks’Thank You for the Days, was a tribute to a rock and roll scene whose biggest stars from Jimi Hendrix to the Beatles and the Who had been keen to meet the great Luke Kelly on his tours to America more than a decade earlier. The second was Song for Ireland, the last song he ever recorded in a studio, his final classic. And for more than thirty years after his death in 1984 Luke Kelly’s music has been shared. When he finally succumbed to his illness at the young age of 43, his farewell in Whitehall was an event belonging to the annals of the great Irish funerals—just as they had with the Parnells, O’Donovan Rossas and MacSwineys, thousands flocked from across the island to see Luke Kelly on his way, an outpouring of grief for an icon who was loved so well. Ireland shaped Luke Kelly, his music flowed from the heights of its history, rose and fell with its social upheavals, and mourned its unfulfilled promises. 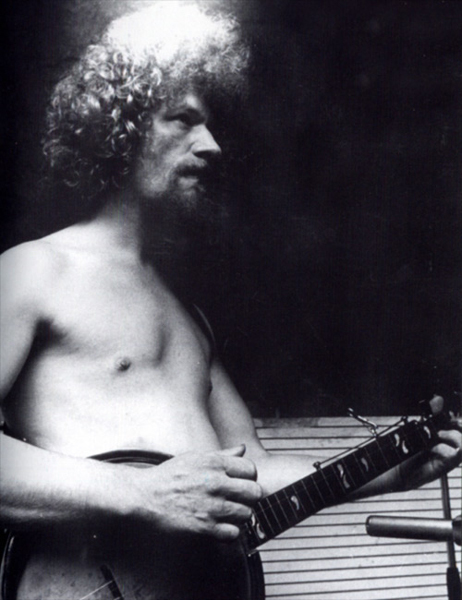 But maybe more importantly, Luke Kelly shaped Ireland. His music became part of the national fabric, with generations of children learning the stories of the place they came from through hearing his voice. But he should not be entombed as a ‘national treasure,’ an empty popular signifier evacuated of his politics and with a relevance only to history. Luke Kelly was a radical, a man who never accepted the inevitability of a social system that left so many behind and made it his life’s work to sing out the struggle for alternatives. Alongside the extraordinary artistic gifts he passed down, this is his legacy today—one that can inform the Ireland of the future as well as reflecting its past. Ronan Burtenshaw is the editor of Tribune.